Like so many American foodies, I grew up watching Julia Child on television. When my son was really young, our Saturday pre-dinner ritual was watching Julia and Jacques: Cooking at Home. The affection these two master chefs had for each other was palpable. At the end of each episode, Julia would sign off with her iconic “Bon appétit!” and Jacques Pepin would add, in his heavy French accent, “ ’appy coo-king!” This has become Tom’s and my catchphrase, our own fond farewell. 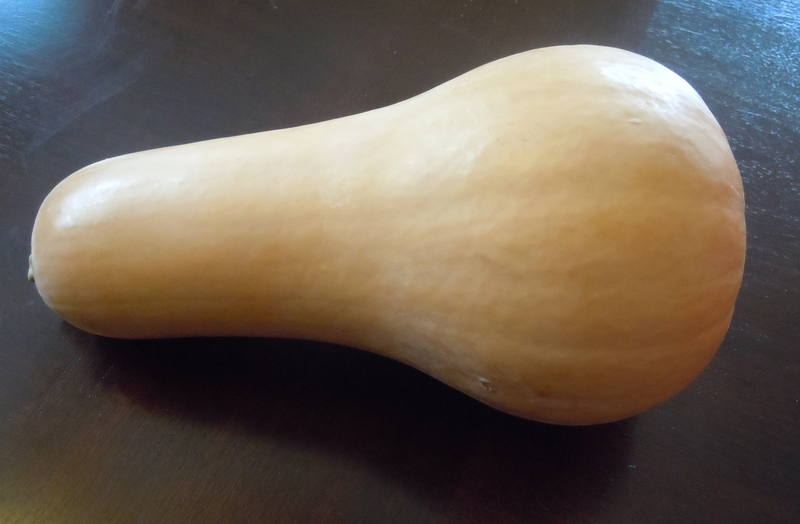 In one of those episodes*, a guest chef made a savory butternut squash dish. 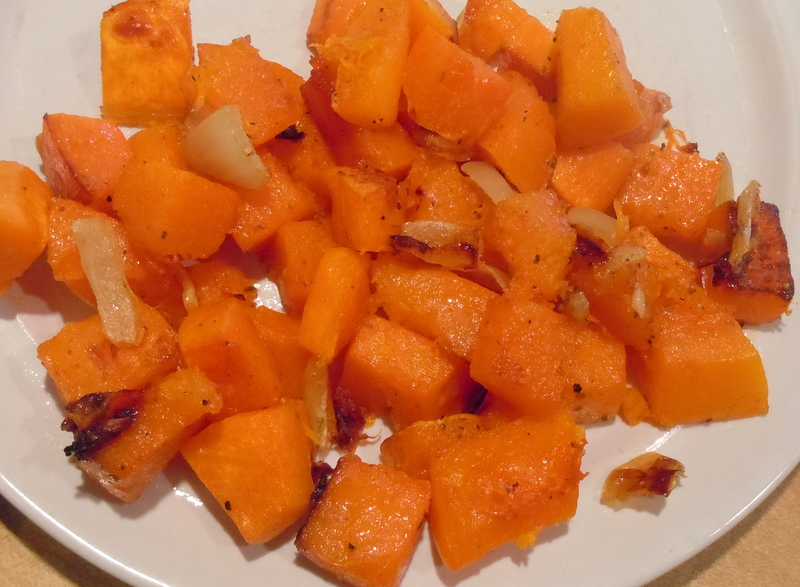 I’ve never been fond of overly sugary, overly rich squash, pumpkin, or sweet potato dishes, so this I had to try. Such a revelation! The sweetness was still there, but it was secondary to the robust, almost floral taste of the squash. The caramelized shallots and little bit of garlic played a supporting role. The cubes of squash have enough natural sugar and moisture that they need very little fat to caramelize beautifully all by their own selves. Anyone who has tackled one of these bad boys knows that the hardest part is the prep. Trimming and chopping a butternut squash takes strength and patience. I find that peeling it first with a good vegetable peeler makes the chopping much easier. And I still can’t believe how many years I risked life and limb trying to cut it first, or to peel it with a knife. Most of the time I sauté the squash in a large skillet, but roasting it in the oven is a little less hands-on and frees up a burner, if you’re in need of one. It’s delicious either way. I had a lovely bowl of leftover roasted squash recently. Soup time! A chopped onion, a few chopped carrots, a clove of garlic and a minced Fresno chile went into a stockpot, to be sautéed in a little oil. (Did I mention that I’m currently addicted to Fresnos? I put them in everything these days, but here I really thought their sweet perfumy heat would blend well with the squash and carrots.) I tossed in a cubed potato and covered it all with chicken stock. Once the veg were tender, the leftover squash joined the party. 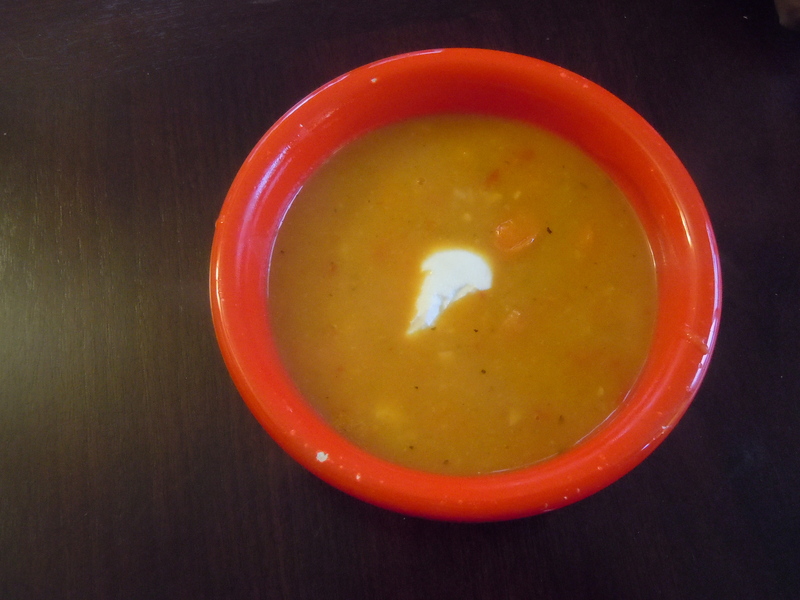 A brisk whir with the stick blender, a dollop of Greek yogurt, and voilá — sunset-colored, sweet-spicy soup in half an hour. Heat the oven to 425°F. 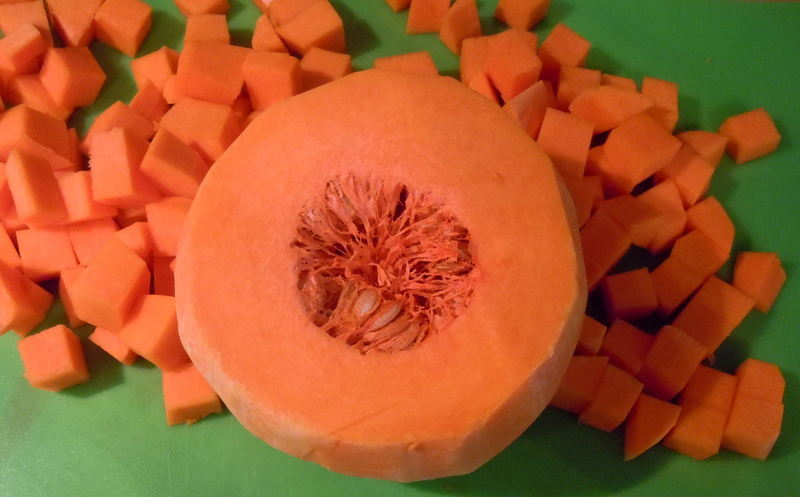 Peel the squash with a vegetable peeler, then cut off the narrow end right where it begins to flare out. Cut the wider part in half, scoop out and discard the seeds. Cut all the squash into 1-inch cubes. Dump them on a cookie sheet and sprinkle with the olive oil, shallot, garlic and thyme. Add a few pinches of salt and pepper. Toss with your hands to distribute everything evenly, and spread them in a single layer. Roast for about 20 minutes. Sprinkle the squash with the brown sugar, give it a stir, and roast for another 10 to 15 minutes until the squash is tender and browned here and there. Makes 4-6 side-dish servings, depending upon the size of the squash. This entry was posted in sides, soups, veggies and tagged butternut, roasted vegetable, squash. Bookmark the permalink.